Yoga class had ended and the group had gathered around a table for some ginseng tea and socializing. Relaxed and mellow the mystical vibe continued as discussion centred first around birthstones, then zodiacs. 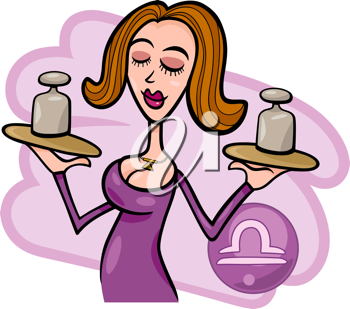 I am a Libra, the sign represented by balanced scales. It is the adjective here that truly defines the personality. If you believe in this sort of thing. Which I don't. Yet, if I'm to be honest I am surprised how well any description of what being a Libra means defines me. I want balance and harmony. I choose to avoid the storms, but will strive to calm them if I can't miss them. I appreciate beauty and like to surround myself with it. As a result I can be hyper-critical of others, moody and a bit of a control freak. Libras too are known for their grace and elegance. I don't know about that, but I do try my best to be my best on a daily basis. It doesn't matter what others think, but I want to put my best face forward for me. So, while I'm fairly certain there's no scientific logic to explain it, while I suspect it's all a bit of malarkey, it's accurate enough to be just a bit of fun. And as a Libra, I love fun. There are the knowing looks when you tell someone you're horoscope. There is a glimpse in a newspaper to see how your day is going to pan out.